What are you thirsty for? T.J. MacLeslie wrestles with this question on his journey from childhood faith through the wilderness and back again. 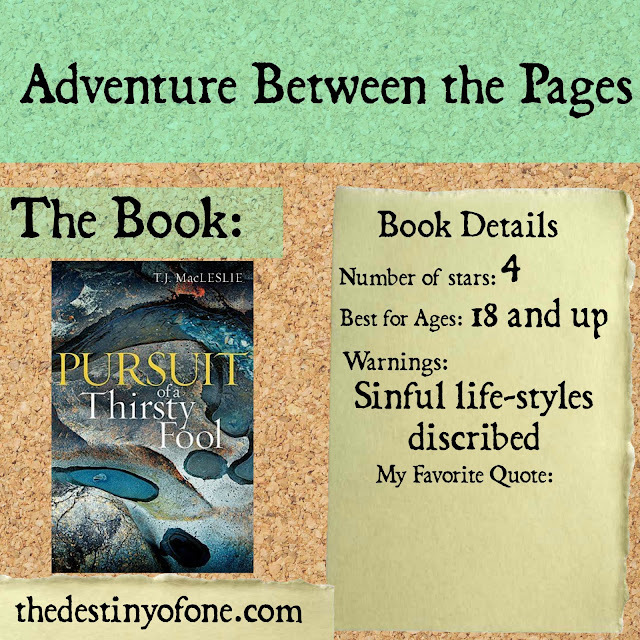 Having been abused in the church, MacLeslie turned his back on God and looked for fulfillment in many places. His search led him to drink from many wells along the way, none of which quenched his thirst. All the while he was being pursued by One who loved him unconditionally. This book is not for the faint of heart, but it is an authentic story that tackles issues of abuse, addiction and personal failure. It also raises difficult questions about leadership, cross-cultural adjustment and disappointment in ministry. MacLeslie's prodigal pilgrimage serves as a cautionary tale, but ultimately a hopeful one. Pursuit of a Thirsty Fool is a book for those who thirst, those longing for more. It is a reminder of our deepest desires and the Spring where they can be satisfied. It is for those who are in need of hope. Finally, it is for those caught in the dangerous pattern of doing things for God and who may have forgotten their first call: to love God. My mom found out about this book and told me; “Sarah, this guy gives review copies to bloggers, you ought to get a copy.” I was skeptical, but I did it for my mom. When I started reading, I have to admit, I cringed. Mr. MacLeslie struggles with a lot of lust, and it was hard for me to swallow. I pressed on and I am so glad I did. Although he is very honest out his struggles, failings, and sins, this story was not about failures as much as it was about finding a relationship with God. T.J. MacLeslie is more open about his struggles than many people are. Yet he does it in such a way the doesn’t glorify sin and shows how hollow that life is. He shows the transformation, not from unbeliever to a believer as much as he shows the transformation from a faith that is dead, to a living, breathing, thriving faith. I wouldn’t recommend this book for children or young teens. However, I highly recommend it to adults looking for inspiration and a closer relationship with The Father.